What I done, I did in self-defense, or I would have been killed myself. Where I was I could not overcome it. The state of Georgia has only ever electrocuted a single woman: African-American maid Lena Baker, put to death on this date in 1945 for murdering her abusive employer. As an interracial liason, it was also entirely taboo; Knight’s son tried everything to separate his dad from this scandalous arrangement, including moving the family and beating up Baker. Knight pere was even more committed to keeping her. On the night of April 29-30, 1944, the elder Knight locked Baker up in the mill, after she’d attempted to flee him. Baker testified that after Knight got back from church — it was Sunday, after all — Baker tried to leave over Knight’s threats. The two fought over Knight’s pistol, and the fight ended when the pistol discharged through Knight’s head. As to how it went off or who pulled the trigger, Baker said she didn’t know. 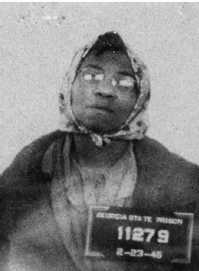 She’s (obviously) the subject of the 2008 film Hope & Redemption: The Lena Baker Story. * Virtual imprisonment of domestic labor: not a thing of the past. ** In 2005, the Georgia Board of Pardons and Paroles — which turned down Baker’s clemency application in early 1945 — issued a posthumous pardon suggesting that a non-death penalty manslaughter charge would have been the more appropriate conviction. Baker’s family and defenders read that as vindication; there’s a detailed NPR story about it here.